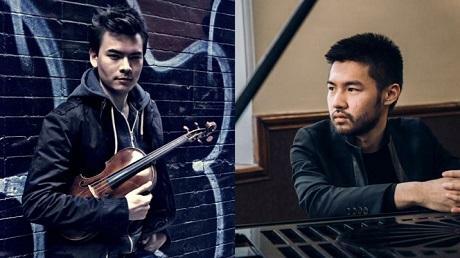 Pianist Conrad Tao and violinist Stefan Jackiw will perform on Saturday night at Interlochen Center for the Arts. The duo visited Classical IPR and discussed their artistic collaboration. They also talked about working with Interlochen Arts Academy students. In Studio A, they performed works by Stravinsky and Lutoslawski. The recording was engineered by Brock Morman. An edited transcript of their interview is available below. IPR: How did your collaboration come together? Conrad Tao: I guess it started with another project that we have together. Stefan and I play in a piano trio called The J.C.T. - The Junction Trio - and I think Stefan and I realized how pleasurable it was to play with each other. We played our first show as a duo last summer, and we're in the midst of our first kind of mini recital tour. It seems very easy and organic to me. Stefan Jackiw: Although obviously we have different musical personalities, I think we share the same musical values. There is a lot of intersecting ideas, even though we're coming from different places. IPR: What are you most hoping to bring to audiences when it comes to repertoire? SJ: I think just sort of the immediacy and kind of primal, visceral nature of this music, especially on this program. Some of these pieces are pieces that have been played for centuries - for example, the Brahms sonata But we try to bring a freshness, not for the sake of being fresh, but just to try to capture the kind of wonder of first discovery. IPR: Can you tell us about the selections here in Studio A? CT: We're going to be playing three movements from Stravinsky's Suite Italienne, which takes baroque material - centuries old at the time of composition - and repurposing it, kind of re-appropriating it a bit. IPR: You're each working with the Interlochen Arts Academy students during your visit here this week. SJ: We’re each doing a masterclass. I will also be hosting a mock conservatory audition. I've given several master classes, but I've never actually done this before. This mock audition is a really valuable thing to think about. You know it's an important part of being an aspiring musician. I'm glad that I was asked to do this. CT: It's also kind of cool because, as a musician, there aren't a lot of things akin to college prep. This is the first instance I think I've encountered where it's really practical. I'm all for practical knowledge. IPR: The partita by Witold Lutoslawski is on the program in Dendrinos, and you brought it for us today [to perform in Studio A]. CT: The Lutoslawski partita takes its title from the baroque suite form of the partita, which historically has been a collection of dances. Through its title, it alludes to an earlier form but doesn't necessarily make clear how each movement directly relates to these ideas, say of a gavotte or a bourree or anything like that. He just gives you movements and music. For me there's a sense of interaction between the violin and piano which alludes to a kind of dancing nature. There's a deep pulse-driven quality throughout most of the music, even as it kind of mutates. Catharsis Wind Quintet came to Interlochen Public Radio during their recent visit to Northern Michigan. The group performed in the Dendrinos Chapel Recital Hall, played for students in area schools and worked on chamber music with students at Interlochen Arts Academy.